Here in Somerset we were deluged with storm warnings and advice from the Met Office during the run up to the end of last month. It’s a tricky business, keeping a handle on our perennially unpredictable weather and the MO, forever on the alert to avoid another Michael Fish blooper, duly broadcast about a week’s worth of advice on how to stay safe and protect property. The wind picked up over the week-end and rain came and went …and then came again, with more serious intent. On Sunday night the noise on my roof, here in Castle Cary, was incredibly loud, the streets of were awash and I actually considered sleeping somewhere different from my usual spot, directly below a chimney stack that needs re-pointing. Anyway, to cut a long story short, I woke up on Monday morning to… well, nothing much of note – just the usual aftermath of a severe rain storm, though none of the shops was flooded this time (in itself a miracle). Things were a little different over in Haddon Wood. notanotherthistle had been out and about since the early hours of Monday morning and during the course of the day reported back. 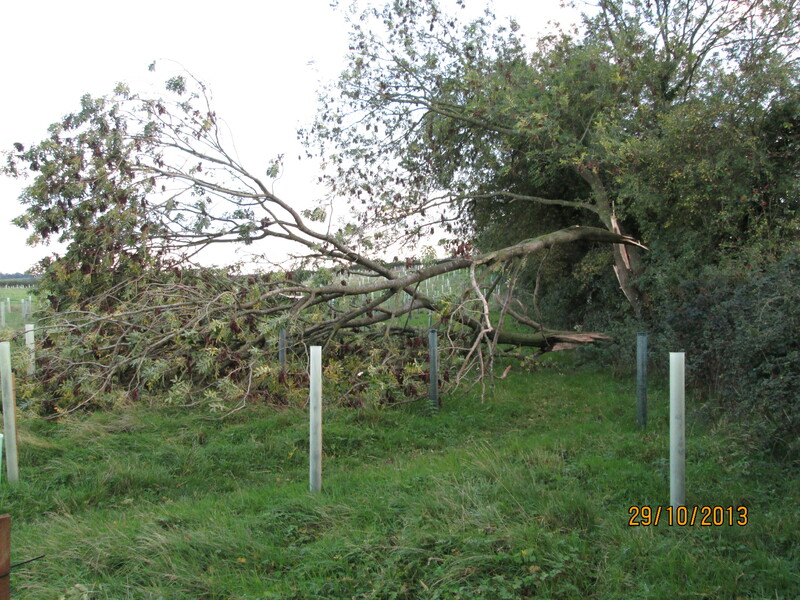 In some quarters Alhampton is known as The Swamp (it’s low-lying, a bit damp, on heavy clay) and yet again it seems to have been a bit of a target – the combination of wind and rain had taken a toll on a fair number of hedgerow trees throughout the village. Without exception the victims were either overloaded with burgeoning clumps of ivy, or had forked trunks leaving them vulnerable. (NB The WT operates a policy of non-intervention, presumably on the basis that if trees fall, the resulting rotting wood will form wildlife habitats of their own, but I wonder if there’s anything that would trigger an exception to that stance – Elfin Safety?). The trees in Haddon Wood are still too small to have attracted the storm’s attention, but there were one or two lucky escapes: a large ash in the hedgerow up the side of F2 has dropped half it’s canopy, but it looks as though most, if not all, of the young trees are poking up through the foliage! Categories: Alhampton, Haddon Wood, Woodland Trust | Tags: hedges, storm damage, trees | Permalink.